Each month, we will be updating you on all our expansion news, including updates on the new Ronald McDonald House in Boise and the Ronald McDonald Family Room in Idaho Falls. 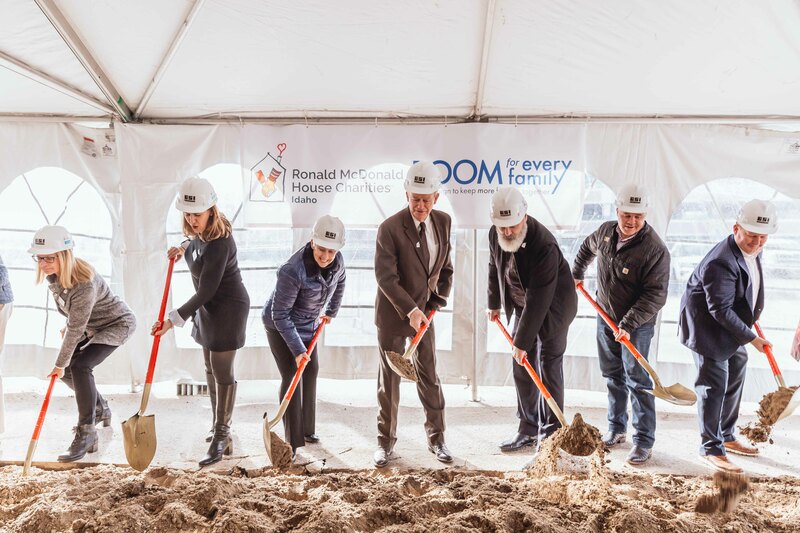 It’s official: on Friday, Feb. 1st we broke ground on a brand new Ronald McDonald House in Boise to serve more than three times as many families. Thank you to everyone who came out to our Groundbreaking Ceremony in support of this historic moment, including Governor Brad Little, Gay Simplot, local McDonald’s owners/operators, Engineered Structures, Inc. (ESI), Cole Architects, and so many more. Now that we’ve broken ground, construction of the new House has officially begun, which is expected to take about 11 months. In addition to the start of construction, as of January 30, we officially own the land we’re building on. Working with St. Luke’s on land that would best accommodate a larger Ronald McDonald House, an agreement was reached to trade land ownership, allowing both organizations to support families who have loved ones in the hospital. We now own the land we are building the new House on, and St. Luke’s will own the existing Ronald McDonald House. Once the new Ronald McDonald House is built, we’ve moved in, and are operating in the new space, St. Luke’s will be using the existing House to provide housing for families of adult patients who are utilizing services at Mountain States Tumor Institute (MSTI) and other hospital units. Owning the land will not only allow us to remain an independent community asset that serves all medical facilities, but it also ensures that we remain steps away from St. Luke’s Children’s Hospital and a short drive to Saint Alphonsus. In terms of fundraising efforts for the new House, we are currently at $9.4 million raised of our $15.3 million goal. Major donors to the project so far include AbbVie, J.R. Simplot Company and family, McDonald’s owners/operators of Southern Idaho, Lamb Weston, and RMHC of Idaho Board and staff. View an updated major donor list here. There’s still about $5.9 million left to raise, which means we need your help. Help us make room for every family and make your donation today. Also, be sure to check out the livestream and photos from the Groundbreaking Ceremony. We are thrilled about all the support we’ve received after announcing plans to build a Ronald McDonald Family Room at Eastern Idaho Regional Medical Center (EIRMC) in Idaho Falls. Thank you especially to Teton Toyota, Cargill, Regence BlueShield of Idaho, EIRMC, Civitan Club of Idaho Falls, Lamb Weston, Fluor Idaho, and Progrexion, for their generous support following the announcement. On February 28, contractor interviews will take place. After a contractor for the project is selected, construction of the Family Room is planned to begin in April. We are well on our way to our fundraising goal of $766,000 for this project, having raised about $512,000 thus far. It’s incredible progress, but there’s still work to do! Help us reach our goal and donate today. Check back next month for new updates on our expansion efforts!